Just spotted this gorgeous pic in the Daily Mail of Christine Lampard covering for Lorraine! So so chuffed that Christine loves her Birthstone Initial Necklace in Gold. Makes me absolutely thrilled to see pictures of people enjoying my jewellery so much. She always wears everything so well! 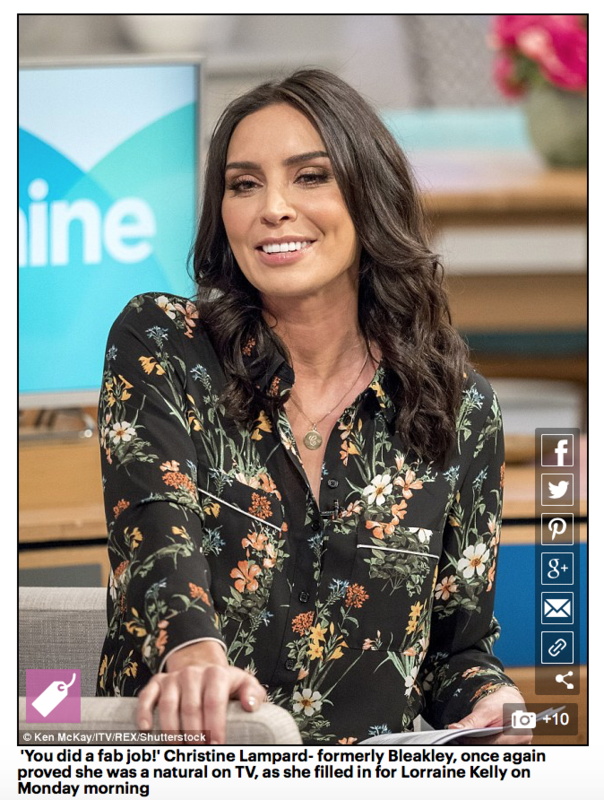 We love seeing the gorgeous Christine Lampard on the Loose Women panel, and it makes me super excited each time when I spot that she is wearing her necklace from the Bianca Jones Jewellery Collection. So so chuffed that Christine loves her Birthstone Initial Necklace and that it appears on my radar on both the television and her stylish Instagram outfit of the day posts. 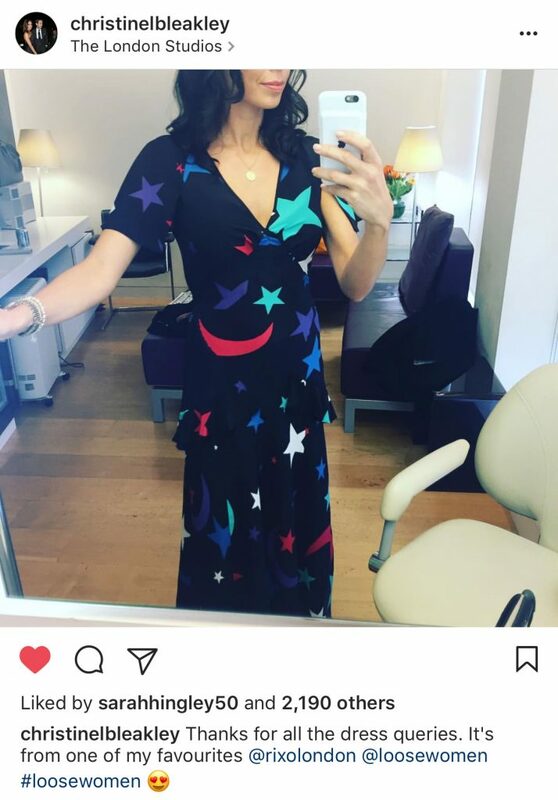 The image is taken from Christine Lampard’s Instagram. The Birthstone Initial Necklace is a classic piece that goes with everything. Due to its beautifully simple and timeless design inspired by Victorian love tokens. Our Initial Collection has kept me super busy in the studio making these beautifully personalised pieces for all you lucky people receiving one from your loved ones. A revival to the Love You More Necklace as being the most popular gift choice, perfect for the lover of all thing monogrammed while also being a hot jewellery trend this season. If you are lucky enough to get a necklace like Christine, the Necklace has been further personalised carrying, even more, meaning and thought due to the sparkly gemstone embellishment. Christine is wearing a Birthstone February Amethyst Initial Necklace in Yellow Gold. Hand engraved with a traditional scrolled ‘C’ as well as her birthstone; the Amethyst embellished in a Victoriana star style setting. A precious gift just for Christine – Mr Lampard you have chosen well, fellas take note! Our Birthstone Initial Necklace Collection has a precious gemstone for each month, each with their meanings, myths, and legends behind the stone. The Amethyst on Christine’s Birthstone Initial Necklace encompasses the virtues of tranquillity, peace and protection. When choosing the right personalisation on your necklace here are some ideas that we have suggested in the past. To make the personalised necklace all about her choose her initial and the precious stone from her birth month, a necklace that celebrates just her. Or perhaps you want to create a loving memento so that she can be reminded of you each time she wears the necklace around her necklace and choose your own initial and birthstone to embellished on the disc. Or make it more subtle and combine these two suggestions, with her initial and your birthstone. If the recipient of the Birthstone Initial Necklace is a new mama, then choose the initial and birthstone of their newborn so that she can carry them close to their heart always. Or for a newlywed choose the initial of their new married name. Celebrate relationships and family love with our Birthstone Initial Necklace. If these ideas are not enough to inspire you, then please do contact us and say hello at orders@biancajones.co.uk and we will be more than happy to help you design the perfect personalised necklace. Create love mementoes to be carried close to the heart with our Birthstone Initial Necklace. The design of the ‘Alphabet Charm and Pearl’ Necklace is really beautiful. Perfect for a special birthday.